Work and family commitments have prevented me from blogging for almost a year for which apologies. I haven’t given up and intend to post the occasional blog as and when there is time. We all know that the summer 2014 transfer splurge was unprecedented for Manchester United, reflecting the parlous state of the squad after years of under investment and the car crash season with David Moyes at the helm. The accounts for the six months to 31st December 2014 show £120.8m of purchases occurred after 1st July 2014. This is in addition to the £60.7m spent in the three months up to 30th June 2014. In total we now know that Herrera, Shaw, Rojo, Di Maria, Blind and Falcao (well the fees associated with his loan) cost Manchester United £181,511,000 last summer. There were sales as well of course. Danny Welbeck, Kagawa, Vidic, Evra and Buttner were all sold and many others sent out on the loan. The accounts show the sales brought in £22.2m in cash. That still leaves an extraordinary net spend of £159.3m. [Note: an earlier version of this blog incorrectly stated receipts of £75.4m, which was the original book cost of the players sold. Apologies]. Except United didn’t have £159.3m to spend. At 30th June 2014, United’s cash balance was £66.4m. And the club didn’t spend all that money in any case. The last few sets of accounts show Manchester United are increasingly buying players on credit, from the clubs that sell them. Transfer fees are agreed but payments are staggered over time, with the vast majority due within a year or 18 months. Whilst other clubs have frequently “funded” transfer with these deferred payments, this is a new practice for United. 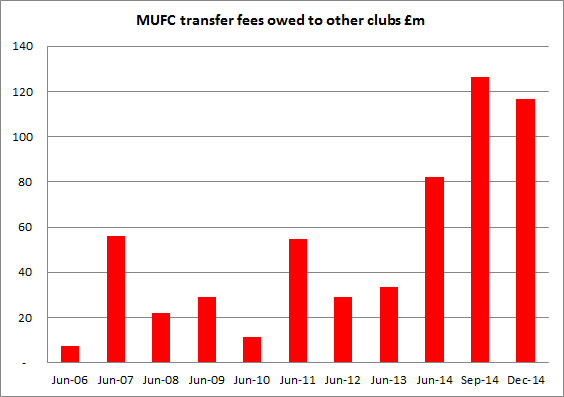 Less than five years ago, United only had £11m of outstanding transfer fees due to other clubs. Things really began to change in the 2013/14 season when the figure leapt from £33m to £82m. In this latest spending splurge it has risen again from £82m to £126m at the end of September 2014, before falling back to £116m by the end of 2014. It’s important to understand that these huge figures owed to other clubs don’t include extra payments based on player appearances or other targets. These “contingent payments” are set-out elsewhere in the accounts and would add another £29.7m to the amount owed if all the payments became due, taking the total to £146m. United is owed transfer money by other clubs of course, but this only amounts to £13.7m. The fact of the matter is that Manchester United owe over £100m in transfer fees to other clubs, more than a whole year’s cash profits. Does any of this matter or is it just another financial “innovation” from ex-investment banker Ed Woodward? Accepting credit from the people you buy from is as old as the hills and a sensible way to fund any business. But the £100m+ owed has to be paid over the next one to two years. That’s going to put pressure on the club’s cash flow, making it even more imperative to get back into the Champions League and even more problematic if we don’t. Future transfers won’t be affected if selling clubs continue to accept stage payments on this scale, but that can never be guaranteed. The new Premier League and Champions League deals promise ever higher revenue in the years to come, which for a Manchester United with debts of £380.5m, which owes other football clubs over £100m and only had cash in the bank of £37m at the end of 2014 is just as well…..
A few people on Twitter have queried whether there is anything noteworthy about this sudden expansion of football creditors. For me the key thing of interest is that it's a new approach. Take 2012/13 when we signed RVP, Kagawa, Buttner, Powell and Zaha. The accounts show spend of £51.2m and how much did we owe other clubs? £33.6m, up from £28.9m the year before.